We have all made that journey to the gift table, setting our gifts with the other zillion of them there and watching, as it gets lost in a sea of wrapping paper, ribbons, and bows. Well, wouldn’t it be nice to give something that 1) requires no wrapping (yesssss, coming from someone who always has to run out last minute for wrapping paper or gift bags) 2) stands out from the crowd (i.e. doesn’t come wrapped like ¾ of the presents there // you can thank your registry for that! ), and 3) keeps on giving (hells yes)?! We have something that legit checks off ALL of those boxes, and it comes from Artificer Wood Works: creators of the most clever and deeply personalized gifts that you’ll be proud to give and the recipient will be honored to receive. 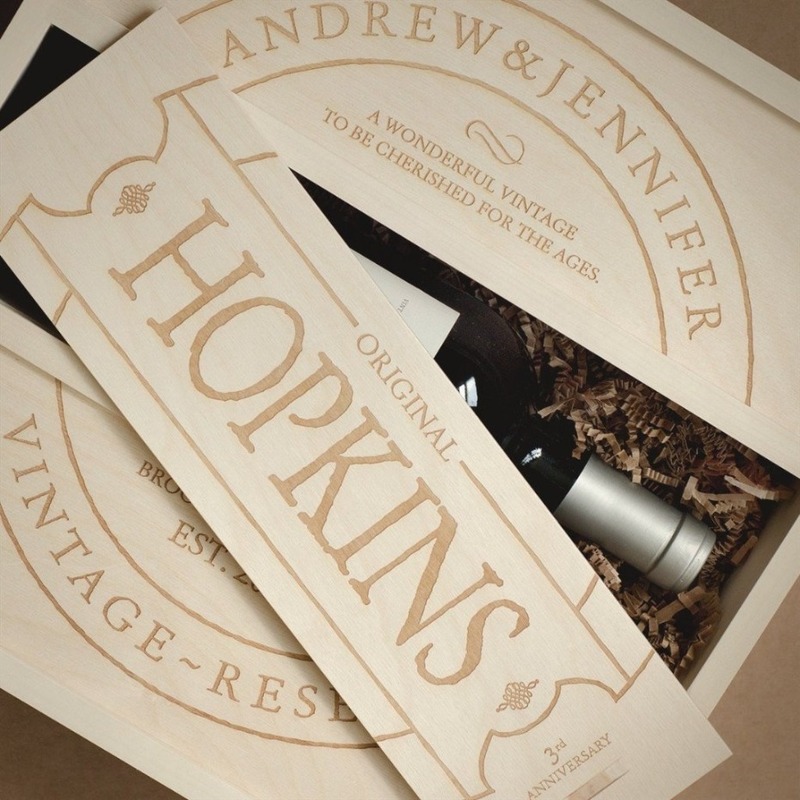 With many custom designs to choose from and amazing personalization that you’re able to add to the box, the patented Wedding Anniversary Wine Box makes for a super unique and special gift-giving experience. That’s exactly what an engagement gift or bridal shower gift should be, amirite? I remember receiving a basket of milestone wine bottles (to drink for our first house, first baby, first fight, first anniversary, etc.) from my sister and my siblings-in-law for my own shower, and it was by far my favorite thing. And now that I’ve seen the WAWB, it’s something that I knowww I’ll be keeping in mind for all my newly-engaged friends and my cousin, whose shower is right around the corner. How bespoke are we talking? 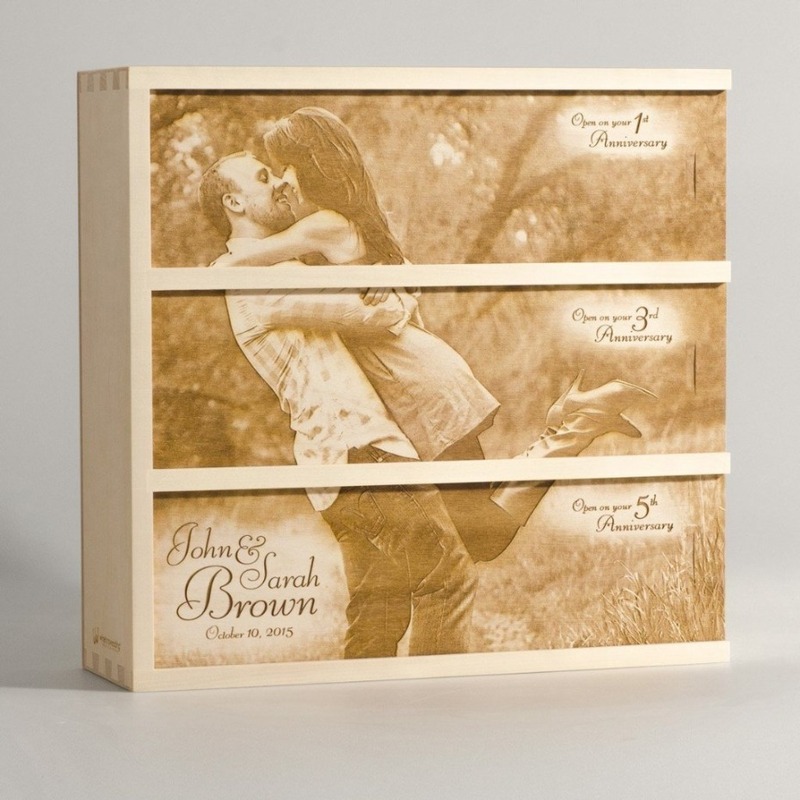 First of all, the trinity-style boxes are beyond beautiful - there’s even one - the Live Laugh Love box - that matches the whimsy font we used for our wedding invitation. Who even cares about the wine inside? The box is the best part…. (kidding, there’s clearly a bottle of Malbec somewhere out there crying over my lack of interest). We love that you can inscribe each lid with a meaningful sentiment, well wish, or insightful piece of advice for the couple, which will absolutely make them smile when they slide off the panel and reveal the message. Oh, it’s FREE, too, so if you pass on personalizing, it’ll definitely be a missed opportunity (in other words, don't do it)! If you’d like to create-your-own design or add a photo of the couple, these options are available and very reasonable, as well. I know a few brides out there, currently, who are dyingggg to receive the first memento of their future last name. That’s what makes this gift engagement party gold. What if I just want to buy one for myself? You totes can! But here’s a better idea, especially if you’re open to putting a personal spin on your wedding ceremony. 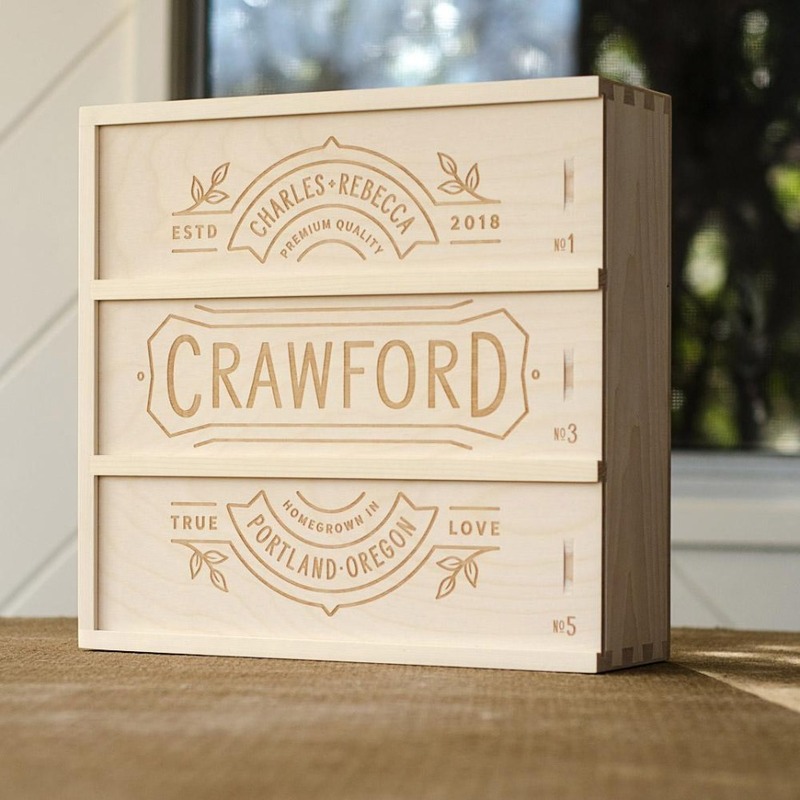 Ever hear about a wine box ceremony? The idea is to work together (you two, as the soon-to-be-weds) in the weeks leading up to your wedding, by gathering sweet reminders of your planning process, photos from the day you got engaged, relics of the special moments you’ve shared with your loved ones in celebration of your union, then having your officiant lead a ceremony wherein you place the items in a special wooden keepsake box, along with an ageable wine, glasses, and love letters to each other to read on a specific date (1st, 5th, 10th anniversary, etc. ), and seal it together to be shared privately at a later time. 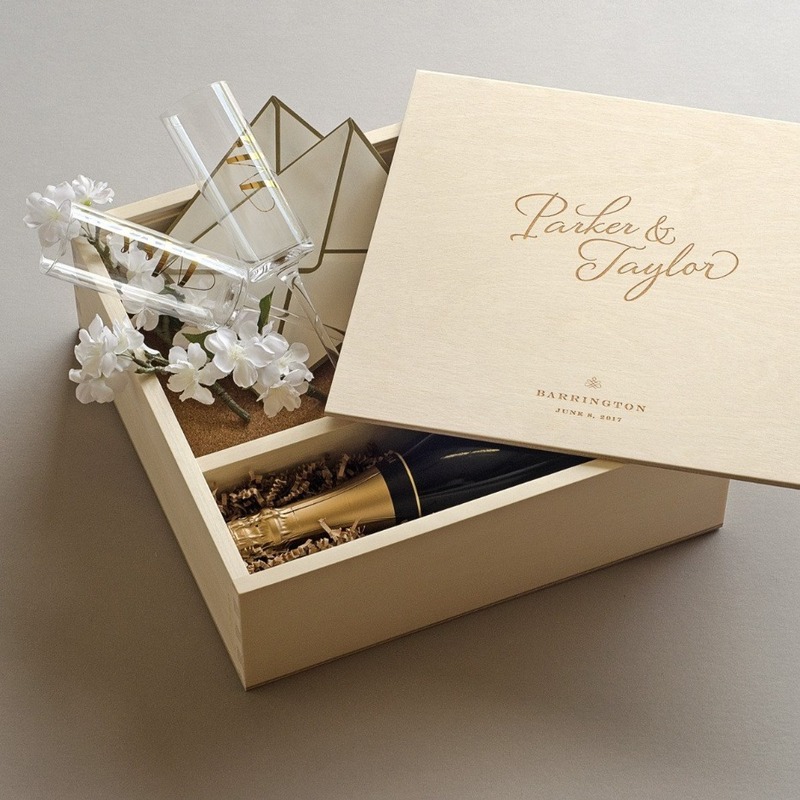 If the wine box ceremony isn’t your taste, you can also decide just to exchange keepsake boxes with each other, on the morning of your wedding. If cocktail nibs somehow find their way into your boxes, it’s okay - the nerves need to go anyway! Any thank you gifts to your bridesmaids, groomsmen, and parents are great and certainly show your gratitude. But how about going against the grain with something that isn’t jewelry, a handkerchief, a flask, or some kind of photo frame? 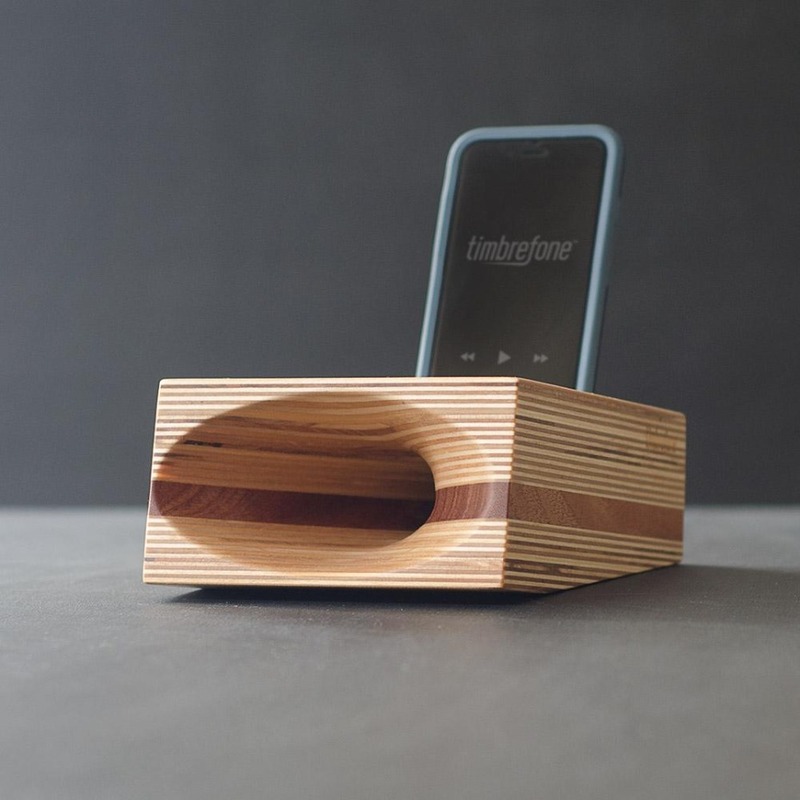 Artificer Wood Works has customizable wine boxes, bottle openers, and Timbrefones (wood passive speakers) that make for exceptionally-unique and special gifts, and show just how much you appreciate all of the hours they’ve logged on your behalf. I’m not a guy, nor do I like beer, but the handmade bottle openers are pretty badass…I wouldn’t mind cracking one open, just to see how cool it works! We partnered with Artificer Wood Works to share an out-of-the-box gift idea for your next wedding-related party. As always, thank you for supporting our sponsors!